Arjuna (son of Kritavirya hence, famously known as Kartavirya Arjuna) was king of Maheshmati. He was from Yadavas or Haihayas (a branch of Yadavas). He is believed to be an incarnation of Sudarshana Chakra. He got boon from Lord Dattatreya which made him so powerful. His greatest deeds were his defeat and imprisonment of Ravana, king of Lanka. Kartavirya Arjuna eventually met his death at the hands of Lord Parashurama. The son of Jamadagni (Parasurama), after twenty-one times making the earth bereft of Kshatriyas wended to that best of mountains Mahendra and there began his ascetic penances. And at that time when the earth was bereft of Kshatriyas, the Kshatriya ladies, desirous of offspring, used to come, O monarch, to the Brahmanas and Brahmanas of rigid vows had connection with them during the womanly season alone, but never, O king, lustfully and out of season. Name of kings from Ikshvaku vansh who were killed by Lord Parashurama? Name of kings from Pauravas who were killed by Lord Parashurama? 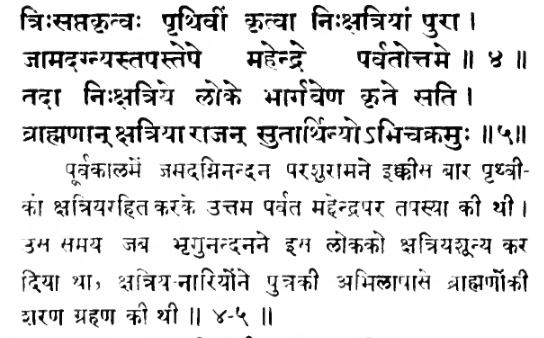 Name of kings from Yadavas (other than Kartavirya Arjuna) who were killed by Lord Parashurama? Name of kings from any other famous dynasties who were killed by Lord Parashurama? Did Lord Parashurama kill any king who was not from Yadavas or Haihayas? If yes, then who were they? If no, then what's the riddle of killing all the Kshatriyas 21 times? Browse other questions tagged mahabharata puranas parashurama chandravansh suryavansh .